Open Age's Work Routes 50+ employment team has successfully helped dozens of job seekers find employment. For a recent list of job placements, please click here. Below are a few of the success stories of people who've been helped back into employment by Open Age. Patricia Thornhill, whom Open Age helped gain employment as a Care Worker for Westminster Homecare, was awarded a certificate for Care Worker of the Month. 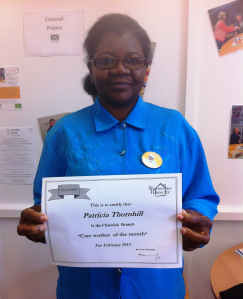 Well done Patricia! Corine was in sustained employment as a cinema projectionist at the Barbican Centre in London for 22 years. However, she was made redundant in Aug 2010. As her job/skills set for this work was now obsolete, she had to consider career change. She attended a local college and completed the OCR Certificate in fitness Instruction. However, because the course did not include a work placement, Corine was not able to obtain work in this sector. At her diagnostic interview at Open Age's employment centre, we also discovered that she needed a Level 3 qualification for employment in this role. We identified career change and lack of relevant experience and appropriate level of qualification as the main barriers to employment as a fitness instructor. We contacted HR Administrator in Westway Development Trust. Corine successfully completed an application and was offered a work placement on the Sunday Ladies Only evening at the Fitness Club in February. During the course of her placement, Corine’s confidence grew. She was supported with relevant training by Westway and she is now paid for her Sunday work and asked to cover sickness and holiday slots. Corine is delighted with this outcome. She has secured a footing in the sector and is now determined to do a level 3 qualification which will secure her sustainable employment. She has also updated her IT skills with Open Age and has been supported in our Work Club with applications for part/full time work.